I am not going to wax lyrical about the abundance of fresh seafood I have access to, but I am going to sing the praises of using coconut oil when cooking mushrooms. I made use of a simple meal to add this extra depth of flavour to our enjoyment. 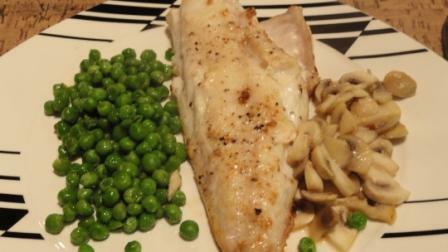 Here I have made gurnards with mushrooms and peas. To me, mushrooms are the perfect side dish to go with fish. I have recently started using coconut oil in our kitchen and these add such a nice flavour to the mushrooms. Also, you can never go wrong with peas in my opinion. I cook them from frozen and add fresh mint and butter. If serving with fish you can change the mint to dill if you prefer. No in depth recipe for these gurnards is needed. All you do is melt some coconut oil in a pan – I use about a tablespoon and when melted add the sliced mushrooms. Do not add salt until the mushrooms have started cooking and if need be, add a bit of butter. Once the mushrooms are completely cooked, remove from the pan and set aside. Now add a little bit of oil to the pan and cook your fish skin side down. Flip to cook the top and serve as soon as it is done. I don’t believe I have ever eaten a gurnard! this was my first, and they are really tasty!